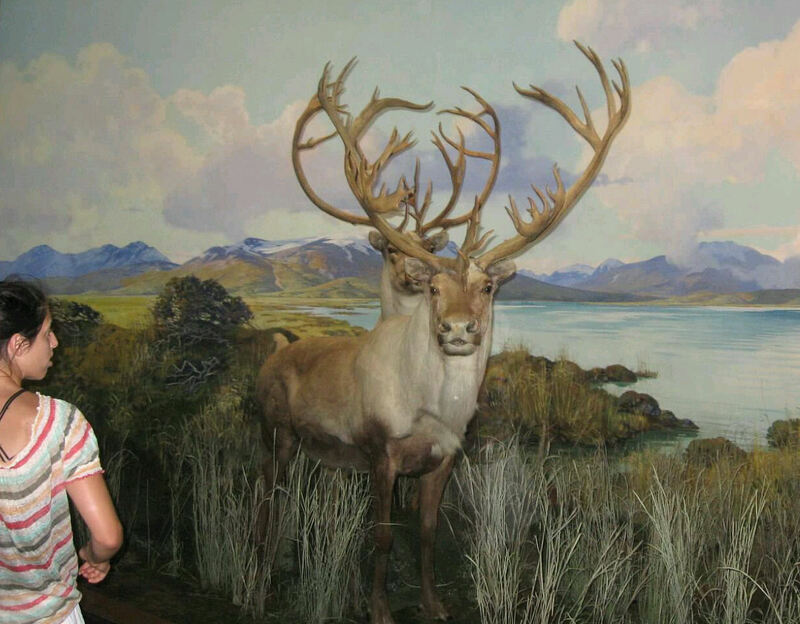 Our 2011 Road Trip #9: Natural History Repeats Itself « Midlife Crisis Crossover! Unda da sea! Unda da sea! Pretty you betcha, until they getcha! You’d betta flee! The B train carried us from Rockefeller Center underground up north to the American Museum of Natural History. Our primary motive wasn’t to search for correlations between the real museum and its counterpart in Night at the Museum. 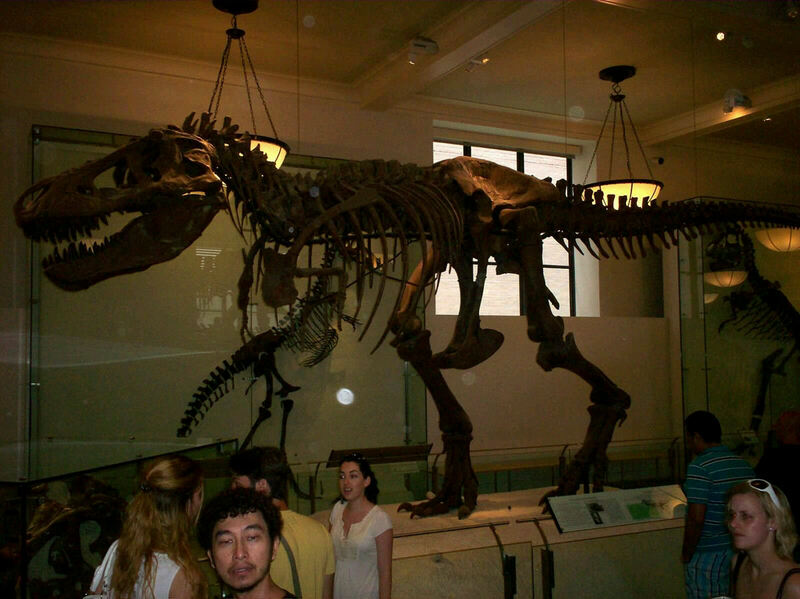 We’ve previously visited the Smithsonian’s National Museum of Natural History in Washington DC in 2003 and Chicago’s Field Museum of Natural History in 2009. 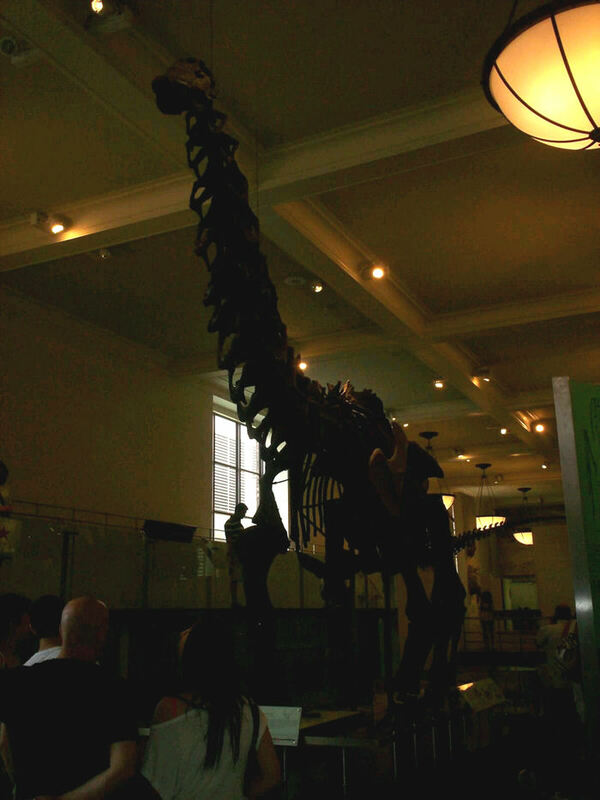 Checking out NYC’s own Natural History museum seemed a logical step to continue that tradition. To our dismay, “logical” though it might have been, for us the watchword became “redundant”. 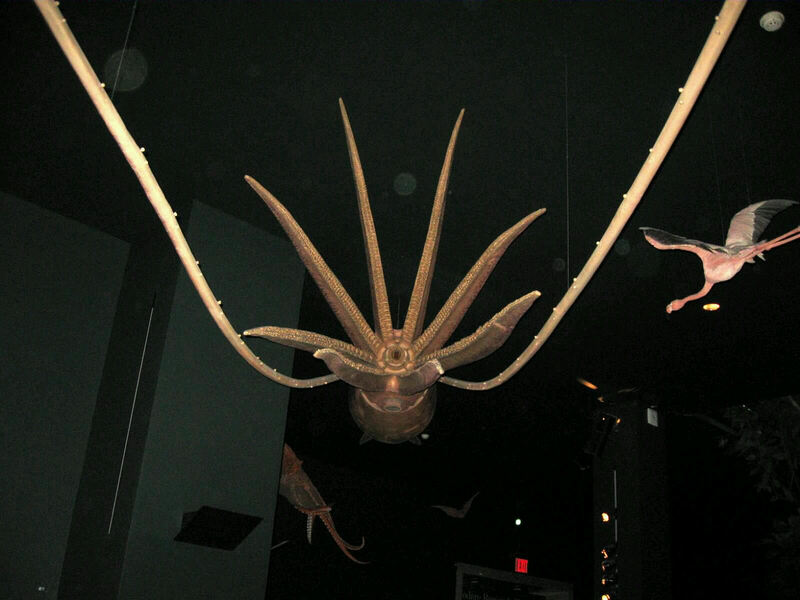 Nearly all its exhibits replicate the efforts and results we’d already seen at the first two natural history museums, not to mention Indianapolis’ own Children’s Museum and Indiana State Museum back home. Many of the dinosaur fossils in particular were practically a Gus Van Sant shot-for-shot remake of Chicago’s own, with entire dinosaur heads, bodies, and placards we’d seen before. There’s something wrong with thinking to myself, “If you’ve seen one natural history museum, you’ve seen them all,” but that’s where we found ourselves. Suddenly we were a family of museum snobs. 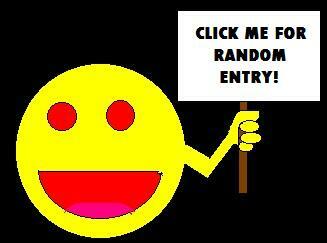 I did try to unearth a few new nuggets where I could. 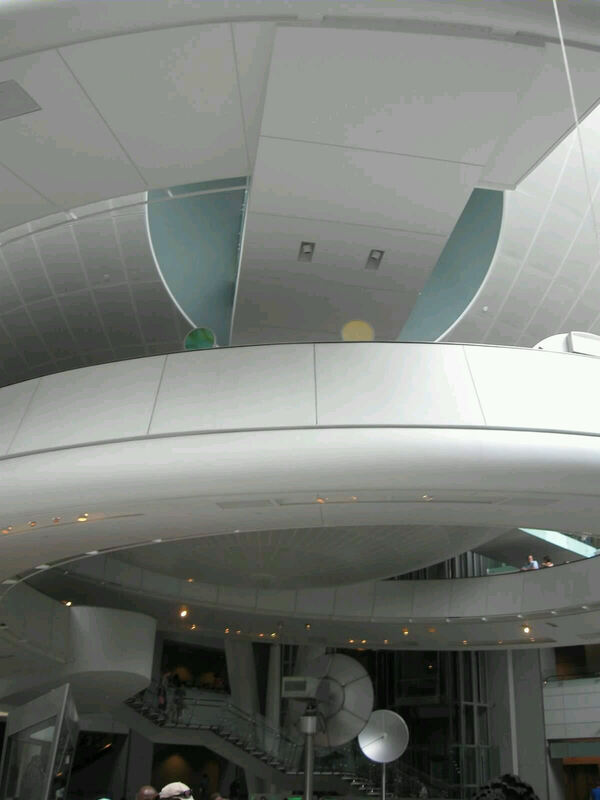 The sci-fi staircase in their foyer was the coolest sight in the place. Welcome to the world of tomorrow, which leads to the wonderful world of prehistory! 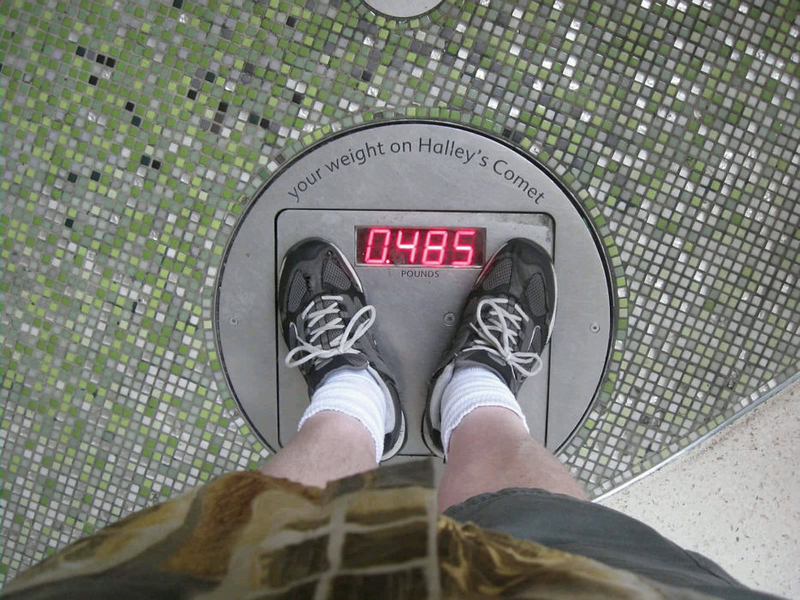 The ground-floor space exhibit includes this special scale that tells you how healthy your weight would be if you landed on Halley’s Comet and vowed never to exercise. One of these would be a welcome addition to their gift shop for discerning clientele like me who disapprove of the results we find in ordinary bathroom scales. If not for my 2004-2005 diet, this photo would be much more embarrassing. 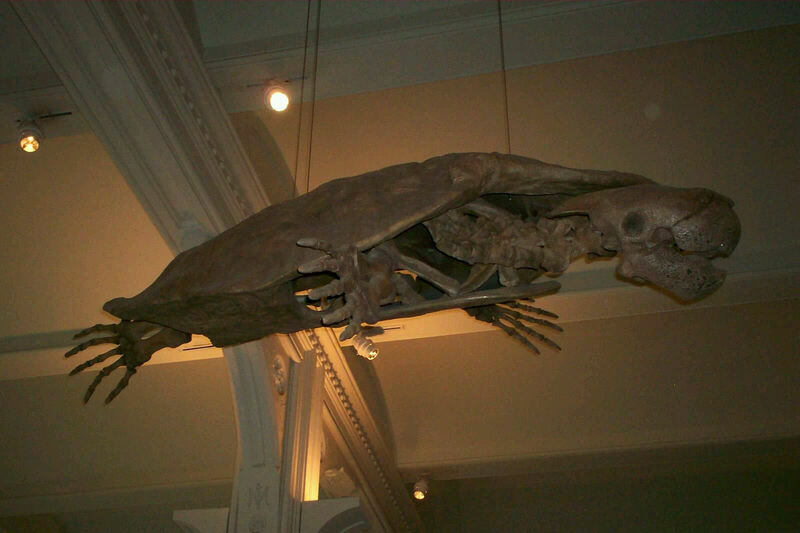 Please enjoy a few fossil photos that serve as verification that we were indeed in a natural history museum. 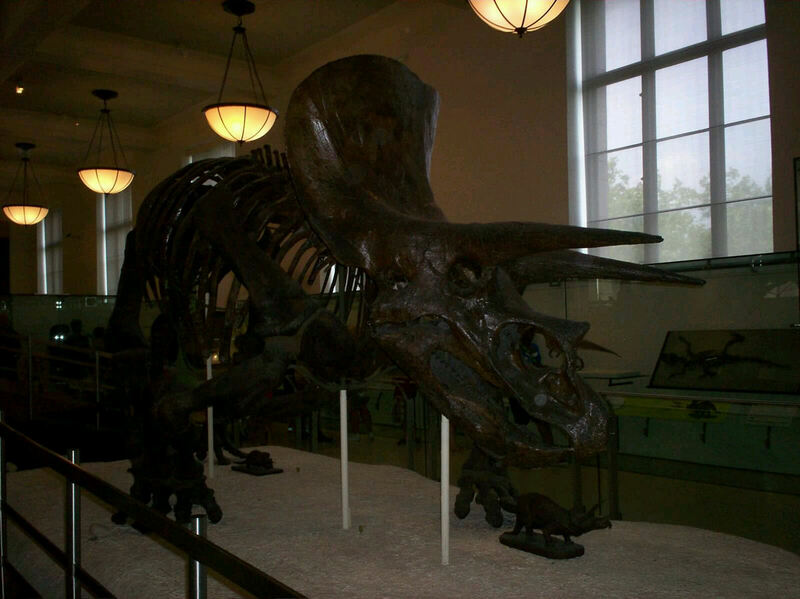 During my son’s Land Before Time phase starting at age 4, this dinosaur was called a Three-Horn. 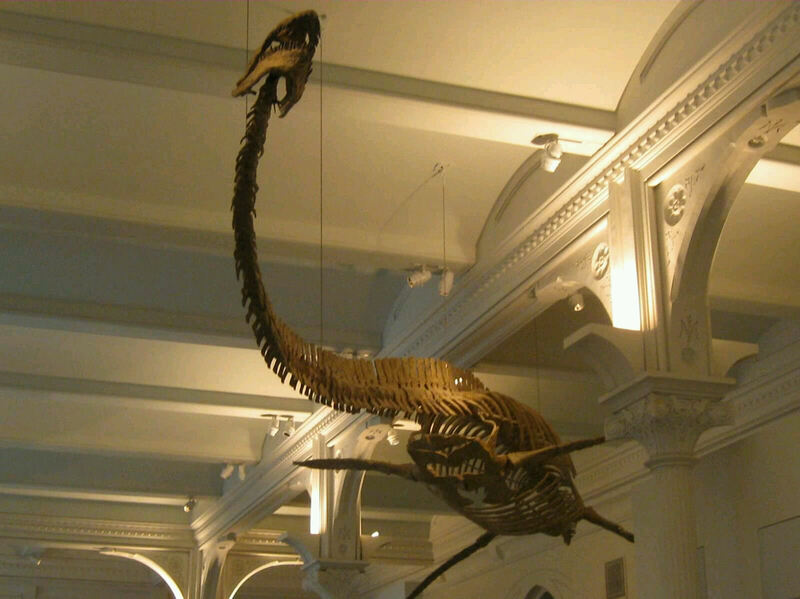 And this was one called a “longneck” because that’s what our hero Littlefoot called his species. I forget how many Land Before Time sequels my son watched, but I know it exceeded the FDA’s recommended lifetime allowance. And a T-Rex was never called anything but a Rex. Even other predators shaped like T-Rexes, till he got slightly older and became a typical kiddie dinosaur geek who could tell them apart. The vaulted ceilings made for a fascinating architectural tour in themselves, but I guess Nessie’s bones were okay too. A rare specimen of flying giant turtle. One day this tiny rascal would grow up and carry Discworld across the universe. Also worth nothing: their parallel collection of dead animals still in their original skins. Sometimes these are more valuable than just the bones alone, kind of like how your old loose Star Wars figures are worth more if you still have the guns and lightsabers that came with them. 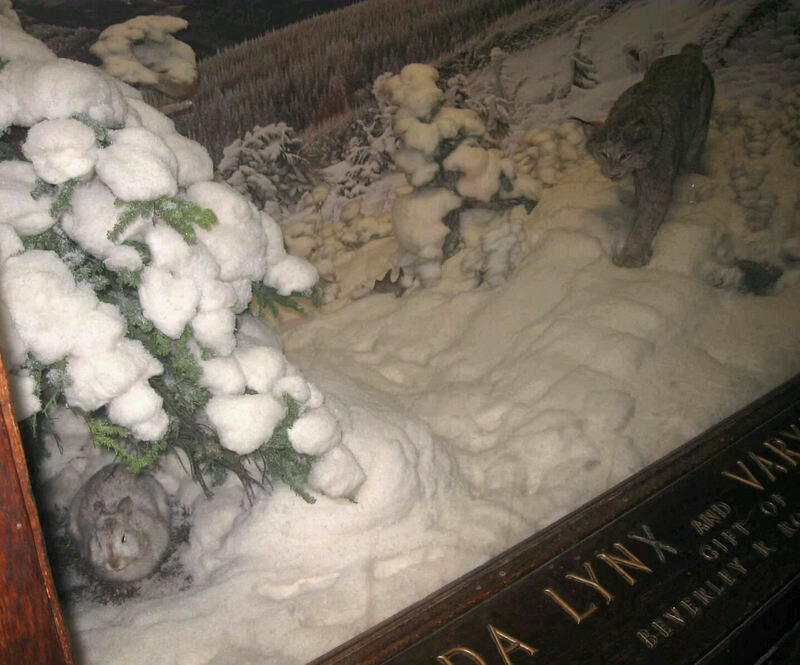 Stuffed lynx hunts stuffed bunny in a stuffed winter wonderland. 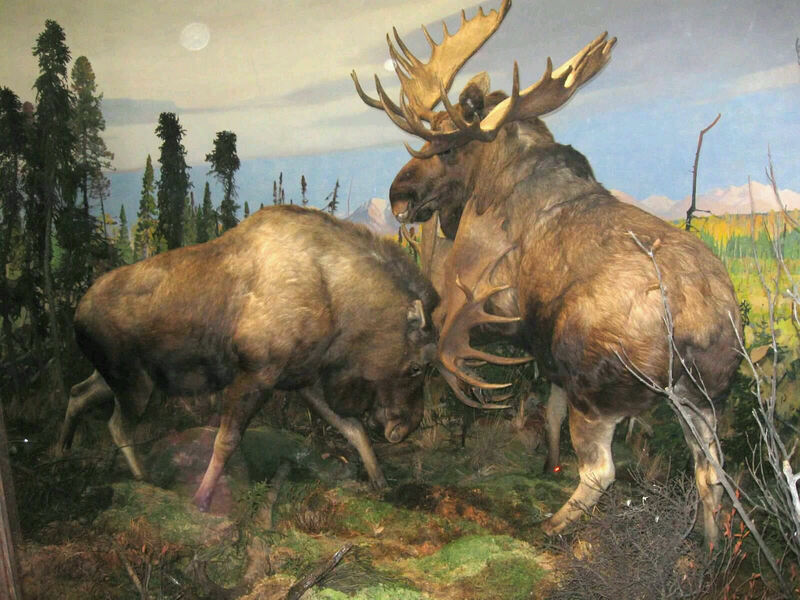 Stuffed moose fights stuffed moose for stuffed turf supremacy. Stuffed monkeys offering to pick stuffed fleas out of each other’s fur. Scene from Disney’s Bambi reboot in which his dad survives the shooting but in response becomes a human-hunting super-villain. 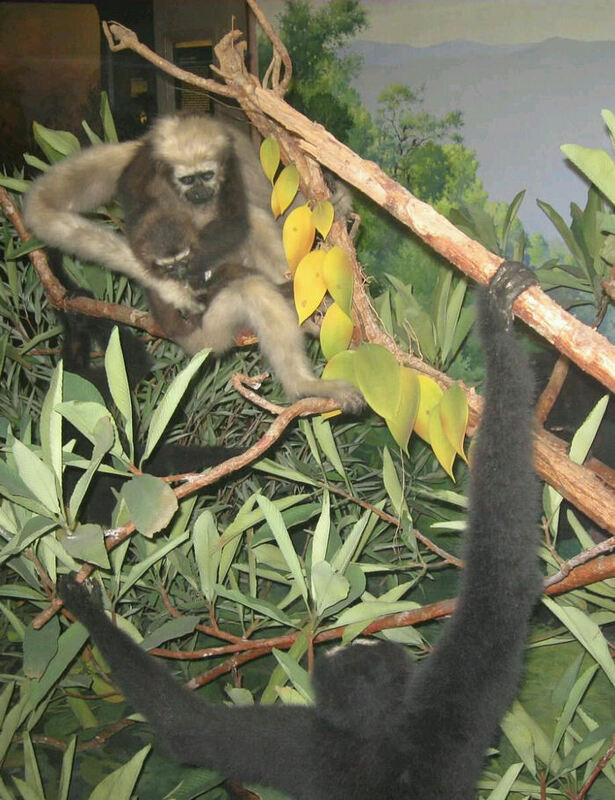 And there’s more than just animals at the American Museum of Natural History! We toured the non-animal areas a bit more quickly, but they were given limited due consideration. 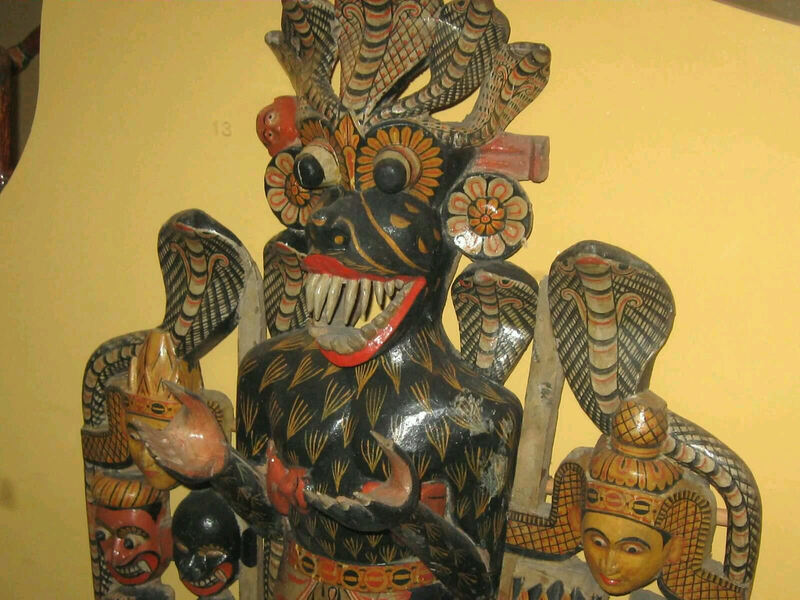 Sinister Asian god threatens nonbelievers with its scary Basil Wolverton fangs. 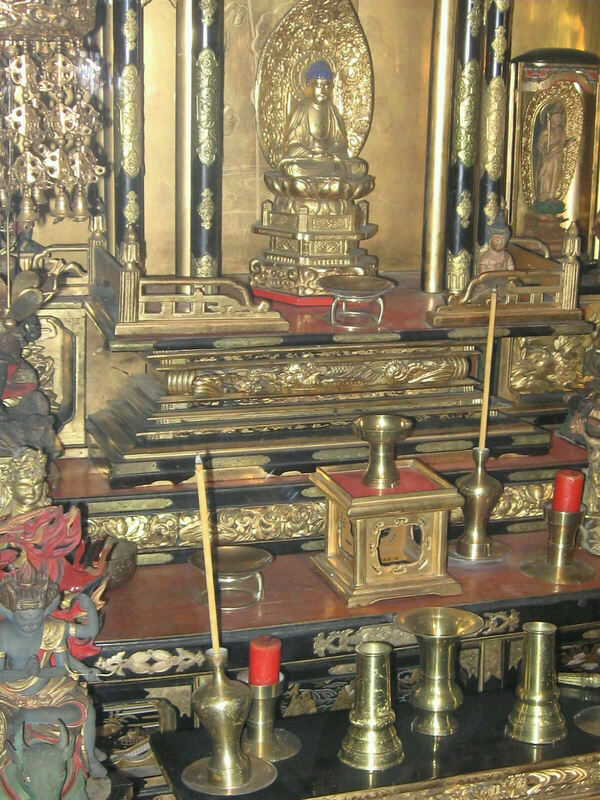 BuddhaWare. Not available in stores! Your desire to order now is grounds for excommunication. I wanted to see their Teddy Roosevelt exhibit and check his resemblance to Robin Williams, but it was closed for renovation. We spent all of three minutes in their impressive ocean life exhibit (see lead photo), but found ourselves booted out — all of us several dozen patrons therein — promptly at 2 p.m. because it was being closed to prepare for top-secret special-event use later that evening. Suddenly we paying customers were persona non grata. FINE. After seeing maybe half of the available not-closed exhibits, our unanimous been-there-done-that sensation, combined with our exhaustion at traversing the museum’s five floors, wore us down to the point of surrender. We did some extra traipsing from one corner of the building to the other so Anne could use one of their smashed-penny machines for one of her pet vacation hobbies, bought snacks at one of their upper-level cafes, and considered our business there concluded forever. 1. Remastering our travelogues out of chronological order has its drawbacks, such as downplaying our “Fossils? AGAIN?” first-world peeve here. We didn’t take many photos at DC’s Natural History Museum, but our 2009 Field Museum outing contains multitudes of the same dead animal bones. 2. I continued regaining weight in subsequent years and now I’m afraid to find out how much more I’d weigh on Halley’s Comet now. Hopefully not too heavy to ride, at least. Some of that we’ve seen. 🙂 South Dakota was the big destination for our 2009 road trip — the Badlands, Rushmore, Crazy Horse, Custer State Park, and a one-day digression out to Devils Tower. Another favorite trip of ours, but I haven’t gotten around to remastering that particular travelogue for MCC yet. Someday it’ll be reposted here along with all our other trips.